[share_ebook] Algorithms & Data Structures: The Science Of Computing (Repost) | Free eBooks Download - EBOOKEE! Posted on 2011-08-22, by trickyexpert. While many computer science textbooks are confined to teaching programming code and languages, Algorithms and Data Structures: The Science of Computing takes a step back to introduce and explore algorithms -- the content of the code. Focusing on three core topics: design (the architecture of algorithms), theory (mathematical modeling and analysis), and the scientific method (experimental confirmation of theoretical results), the book helps students see that computer science is about problem solving, not simply the memorization and recitation of languages. Unlike many other texts, the methods of inquiry are explained in an integrated manner so students can see explicitly how they interact. Recursion and object oriented programming are emphasized as the main control structure and abstraction mechanism, respectively, in algorithm design. Designed for the CS2 course, the book includes text exercises and has laboratory exercises at the supplemental Web site. Douglas Baldwin (Honeoye Falls, NY) is an Associate Professor of Computer Science at SUNY Geneseo. A graduate of Yale University, he has taught courses from CS1 to Compiler Construction, and from Networking to Theory of Programming Languages. He has authored many journal articles and conference papers within the field. Greg W. Scragg (Dummerston, VT) is Professor Emeritus from SUNY Geneseo with over thirty years experience in computer science. Since his graduation from the University of California, he has received several grants related to computer science education and has written over 60 articles for computer science journals. 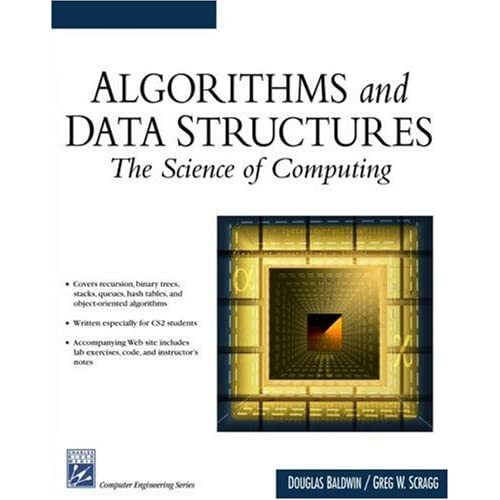 No comments for "[share_ebook] Algorithms & Data Structures: The Science Of Computing (Repost)".